My husband would not watch Steel Magnolias or the Notebook with me. He tried his best to watch a few scenes, but eventually retreated to the computer room and came out for a snack towards the end of these movies. When he saw me bawling my eyes out, he asked “is the movie good?”, to which I quietly replied “yes”. His response was head shake and a nod in disbelief. The book Poisoned had a similar effect on me as the movies. I found myself crying as I read it. Again, my husband queried, “do you like that book?”. My answer was yes. When I shared some of the details about the children in hospitals dying from food poisoning, he replied “doesn’t sound good”. 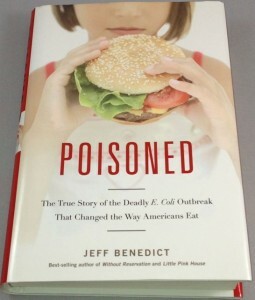 Poisoned, by Jeff Benedict,” The True Story of the Deadly E. Coli Outbreak That Changed the Way Americans Eat”, was a freebie from Bill Marler. He sent a copy to me because I follow his blog (http://www.marlerblog.com) and I am a student in Michigan State’s Food Safety Masters Program. Poisoned told stories of the four children that died in the Jack in the Box E. Coli outbreak in 1993, it told stories of the survivors, it told stories about the food industry professionals working for Jack in the Box, the CEO of Jack in the Box, the attorney Bill Marler and food safety experts. I could identify with the parents of the children that survived and the survivor’s guilt they endured. I could identify with the food professionals and I was brought to tears when reading the stories of the children who suffered and died as a result of E. Coli poisoning. One 2 year old boy that died was initially hospitalized at Marybridge Children’s hospital in Tacoma. The same hospital my daughter at 2 years old received treatment for a brain tumor. My child made it home. I can’t imagine leaving without my daughter and how horrible that must feel. I can’t imagine continuing life without my child. Fortunately, not many children in the United States die as a result of food poisoning. If it was my child that died, though, it would be too many. I think a career in food safety protecting the public could help save lives of those most precious to us. Recently, I accepted a position working in Public Health. My reviews on flavorscientist will change or cease in order to preserve the intergrity of my new position. I will miss you all, thank you for being such a great audience.